Should You Opt for Voluntary Registration Under GST? Every business is eligible for voluntary registration under Goods and Services Tax irrespective of the threshold limit. Read more here. You may opt for voluntary registration under GST even if you are not liable to be registered. All the provisions of GST applicable to a registered taxable person will similarly apply to you also, i.e. you will be treated as a normal taxable person. 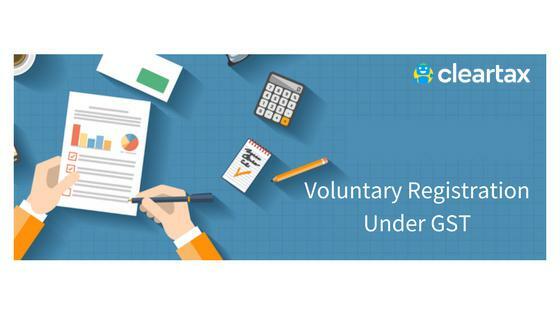 What is voluntary registration under GST? For whom is voluntary registration available? Should you opt for voluntary registration? Is a voluntary registration permanent? As the name suggests, anyone can register under GST even though he may not be required by law. Click here for the entire list of businesses which are required to register mandatorily. Small businesses with turnover less than 20lakhs can voluntarily register under GST. Businesses with turnover 20 lakhs to 1 crore can opt for composition levy. But composition levy comes with additional disadvantages such as not being able to collect any tax from their customers or avail input tax credit. Such SMEs may also opt for to register themselves as normal dealers instead of composition dealers. A small grocery dealer with a turnover of Rs. 12-15 lakh is not be required to register under GST. However, he is also supplying to a nearby restaurant which is registered under GST (having a turnover exceeding Rs. 20 lakh) The restaurant is eligible for input credit and may look for a registered seller who can pass on ITC . In such a scenario, the grocer might register voluntarily to pass on the benefit of input credit to his buyer. Technology– Once of the biggest challenges many small businesses are facing is the technology required for GST. GST registration, returns and payments (exceeding Rs. 10,000) must be made online. This becomes difficult for many small businesses who are used to manual methods. Multiple Return Filing – Businesses registered under Goods and Services Taxes are required to file three returns every quarter. These returns are GSTR-1, GSTR-2, GSTR-3 and include the details of all purchases, sales, and final tax liability after setting off Input Tax Credit. Failure to file these returns will not only deny the input credit to our buyer but also attract late fees, interest & penalty. Further Compliance rating will get affected negatively. Payment of Tax Liability – Once registered under GST, the supplier will have the additional responsibility of collecting and depositing taxes with the authorities. This will not only inflate the cost for the buyer but also leverage similar sellers who are not registered under GST. Loss of advantage- Once you are registered, you will have to collect GST from customers. Unregistered dealers can charge cheaper prices as they cannot collect GST and thus attract more customers. Compliance of GST provisions- Once you are registered, you are bound to comply with all the provisions of GST Rules, Acts and notifications. All provisions such as issuing GST compliant invoices, paying GST under reverse charge mechanism will start applying to you. Assessment and Penal Provisions – Once registered under GST, a business will also be legally bound by the assessment & penal provisions of the GST law. This can attract unnecessary interest and penalty to business due to lack of resources to fully comply. Create GST compliant invoices using our free ClearTax BillBook. If you are a business looking to discover more, please read our articles on GST registration. If you have further queries about GST and registration, please email us at gstsupport@cleartax.in or call us on 080-67458707.